Hotel Krakono, Rokytnice nad Jizerou, Czechy : Rezerwuj teraz! 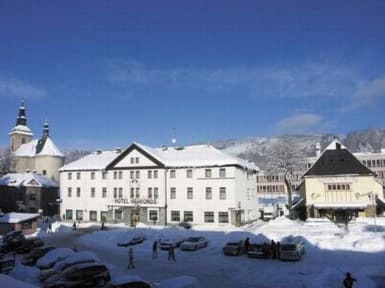 Familiar Krakonoš Hotel is situated in the center of Rokytnice nad Jizerou at an altitude of 600 m in the western part of the Giant. Beautiful countryside - active and passive vacation and holidays are the main attraction of the Giant offers. The hotel reception is possible to pay by credit cards VISA, MAESTRO, MASTER CARD, DINNERS, JBC. During the summer we are offering massage in hotel - order the following at reception desk: hot stone massage, standard massage – partial, standard massage, paraffin wrap on hands, bulb massage, ear candle, honey massage, as well as more active options such as: tandem paragliding, cross country scooters, go-karts raceway, grass skiing, hiking, biking. In the hotel, there is a restaurant, wine cellar, beer hall and summer beer garden. The clients are offered ready-made meals from the lunch and dinner menus, and the hotel provides short orders as well. Hotel Services – Hotel provides rentals of hall for up to 60 guests for congress or presentation events. In the restaurant, wine cellar, beer hall or at the reception, the guest may connect to the free-of-charge Internet via WI-FI. At the reception and in the crèche, there is a separate PC with a connection to the Internet as well. Parking at the hotel is also free of charge. There is a billiard, electric darts and table football for the entertainment of the guests in the hotel. Hotel reception desk accepts Visa, Maestro, Master card, Tinners, JBC, American Express and CCS payment cards. Hotel Krakonoš focuses on accommodation of guests and management of sport events. 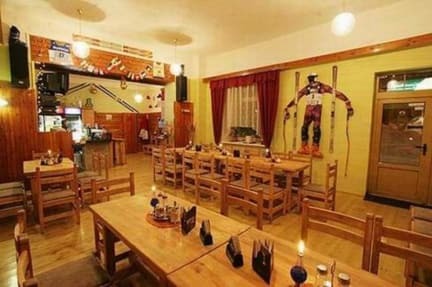 In Rokytnice nad Jizerou and in its close surroundings, there are plenty of means of entertainment – skiing areas from SKIREGION.CZ, sports halls, tennis and volleyball courts, football pitches, a climbing centre, golf course, bobsledding, etc. Rokytnice nad Jizerou is a skiing, recreational, tourist and sports centre located in the Western area of Krkonoše Mountains. Two rope railway and Kotel dominate in the tops of Lysá Mountain in Rokytnice nad Jizerou. The skiing zealots may expect perfectly-surfaced slopes and tracks for cross-country skiing. with artificial snow covering. Complete care is provided by skiing maintenance stations and ski rentals. Interested persons may use the service of skiing instructors from several skiing schools. Directly in the skiing area there is a SKIBUS which is free of charge for the hotel guest. The downhill skiing fans from the skiing areas of Rokytnice nad Jizerou may expect 27 ski lifts and two four-seat rope railways. First one, called Horní Domky, leads you directly from the parking place into the heart of the skiing area, and the second one, called LD Lysá Hora, will lead you to the top of Lysá Mountain. Horní Domly rope railway is 1,213 metres high and has a raise of 253 metres, Lysá Hora rope railway is 2,198 metres long and has a raise of 591 metres – it is the second largest rope railway in the Czech Republic. Cross-country skiers are recommended to use the cross-country tracks in U Kaplicky and Pod Dvorackami area. These are quality white-snow tracks. A marvellous track can be also found in Krkonošská Magistrála which is located along the tops of our highest mountain range. The non-skiing visitors may try Snowtubing – a very entertaining tubing on inflated boats in an artificially-built snow corridor.